As juniors and seniors look for dresses, tuxes and maybe even a date for the the annual, school-sanctioned and widely famous prom, one might wonder, where did this tradition come from? Firstly, let’s address the name. Prom is short for promenade and can be easily defined as a formal parade of guests. But the idea of this century’s kind of prom originates back to 19th century American universities. There, they held co-ed banquets honoring that year’s graduating class, according to Time Magazine. Time also suggests that the banquets kept getting pushed to younger and younger students, until the 1940s where it took its hold on American high schools. In the 1950s, schools began to allow proms to be held in hotels and country clubs due to the thriving postwar economy. Back then it was a parade of the graduating class, but what does it mean to us now? Because the event stems back generations, the reasons that we have prom have changed greatly over the years. Parker Zinn, Carrboro junior and Junior Class Council President, believes that prom is a opportunity for students. “Prom gives students the opportunity to spend a magical night with their peers outside of the classroom and really treat themselves to the experience of a lifetime,” said Zinn, in an interview via email. While prom is a world-wide phenomenon, and has universal traditions, Carrboro also has its own traditions. 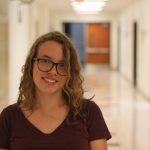 Ella Speer, junior and Class Council’s Multi-Media Manager, shares her take on one beloved Carrboro prom tradition. “I would say that the promposals are one of the most exciting aspects of Carrboro’s pre-prom anticipation,” said Speer, also via email. So why have we kept these traditions alive? Zinn elaborated on the significance of the occasion. “We believe that prom is a vital part of the high school experience because of its unique nature. All students have the opportunity to come together and celebrate each other at a formal dance, spending the night worry-free and having a blast,” said Zinn. 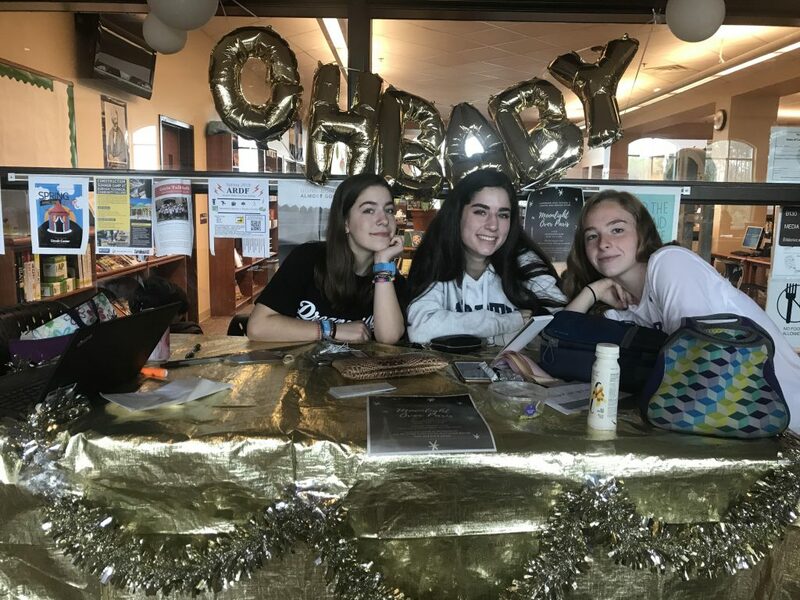 To promote this idea of coming together and celebrating each other, Carrboro’s Junior Class Council says that they cannot do without inclusivity. One way they worked on inclusivity was making sure everyone could afford prom by making sure everyone could access formal wear, and offering a discounted ticket prices for those in need (see Ms. Crider in the CIC for discounted tickets and formal wear). “This year, we hope to diversify prom and make it more inclusive to all. We have discounted ticket prices for students unable to afford regular ticket prices, additionally advertised Cinderella’s Closet and other dresswear businesses for discounted or free dresswear, and we have spoken with students around CHS to discuss ways we may make prom more inclusive and enjoyable for all,” said Speer. Cinderella’s Closet is a charity that compiles gently used and donated formal wear for those who need it. The charity will be held the day of prom, April 13, at the Christ United Methodist Church in Southern Village. You can go there to find dresses, shoes, jewelry and other prom essentials, or you can donate any used prom items for others to try on. Carrboro’s Junior Class Council worked extremely hard on this year’s prom and can’t wait to see attendees on April 13, at Governor’s Club from 8pm -11pm. Prom is coming up soon, but hiring professional makeup artists or using super expensive brushes and palettes can be costly. Doing your own makeup is always an option, and by following these steps you can save some coin and still look great at any dance or event coming up. I personally have invested a lot into my makeup over the past year, so I can tell a poor quality eyeshadow palette from a low quality, and I have found that quality does NOT equal expense all of the time. Some cheaper end, yet high quality, eyeshadow brands include Morphe, Colourpop, Nyx, Coloured Rain and Pacífica, with prices ranging as low as $6.99 if you can catch them on sale. My personal favorite drug-store skin products include Fit Me by Maybelline, and L’Oreal True Match. These two brands have wide shade ranges for their foundations and setting powders while staying under $15 per bottle. The only downside to these is that they can cause breakouts, especially for sensitive skin like mine, so make sure to never sleep in your makeup, or you’ll clog your pores. The average prom dress can go with a neutral eye look, which includes browns, grays and earthy metallics. Even the brightest pink dress can look amazing with a warm neutral eye or a cold smokey eye if done right. Determine the warmth and saturation of your dress to decide which you would like to pop more. If you’d prefer your dress to be the main statement, make sure you do not pack on a bright, contrasting color to the eye, and vice versa. A basic run down as to how eyeshadow should be applied is lighter colors towards the inner eye and darker colors towards the outer corner of the eye. For soft looks, eyeshadow should blend into your skin before it reaches the eyebrow ridge and should fade as it reaches the nose bridge. No eyeshadow should ever touch your nose or brows unless you’re going for an incredibly dramatic or artistic look. So, on to the tutorial. I have done my eyebrows previously with a dark eyeshadow, however any eyebrow brand or pomade will do just as well. If you plan on filling in your eyebrows, chose a color the same or lighter than your hair color and work with the natural shape of your brow to avoid them looking harsh. I also set my eyes with a concealer to make the eyeshadow more pigmented and stick on all night. I will be using the James Charles inner artist palette which is sold for around $40 online and at Ulta, however any neutral palette will do and you can substitute the colors in and out as you wish. My brushes are from aliexpress and Marshalls, and are extremely easy to find at your local drug store and Target. I have large eyelids but they are also relatively hooded, so depending on whatever eye shape you have I’d highly recommend altering this tutorial as you think fits best for your personal face structure. First, I brush a brown color over my entire eye as a base for the shadows. By using a color so similar to my skin, other colors will be much easier to blend out. Next I’m going to take a relatively dark shade and pop it onto the outer corner of my eyes using a small fluffy brush. As I move up my eyelid, I’m going to blend it into my skin as a gradient. Next I’m going to take a lighter brown and pop it the center of my lid and blend into the darker color beside it. If there is an in-between color in the palette, you may use that to blend as well. I’m going to now go back to my original skin-colored eyeshadow and blend that on the outer area of these two colors to cause a soft gradient effect. Next I’m going to take a lighter matte shade and pop it towards the inner crease of my eye going towards the tear duct, and then use my finger to apply a sparkly or metallic shade on top. Brushes often struggle to pick up glitter, so sometimes a finger works better. Depending on the color of your dress and your jewelry, pick a shimmer shade that aligns best with your dress. If your jewelry is gold, use a gold and if it is silver, use a silver. If your dress is a neutral color, adding a burgundy or orange shimmer can be pretty as well, and if you’re feeling bold, blues, pinks and purples can also be stunning. From here I’m going to go back into the outer corner of my eye and choose the darkest shade in the color range of my palette, to give a more dramatic look to the eye. Lastly I’m going to grab whatever highlighter shade I plan to use on my cheek bones and pop it into the deep inner corner of my eye and my brow ridge using a small brush or my finger. From here you can apply your mascara and go, however, if you are feeling extra bold I’d recommend adding some eyeliner. Winged liner can really make or break the look, so I’d be careful when adding this extra element, and the same goes with adding false eyelashes. If you prefer to play it safe, use some concealer from your outer corner up to your brow to add a controlled look to the eye and you’re ready to move on to adding face and lip products to finish off your face! To set your eyes and face I’d recommend Nyx facial setting spray, to maintain that beautiful masterpiece on your eyes that you’ve worked so hard to create. Live it up at prom! 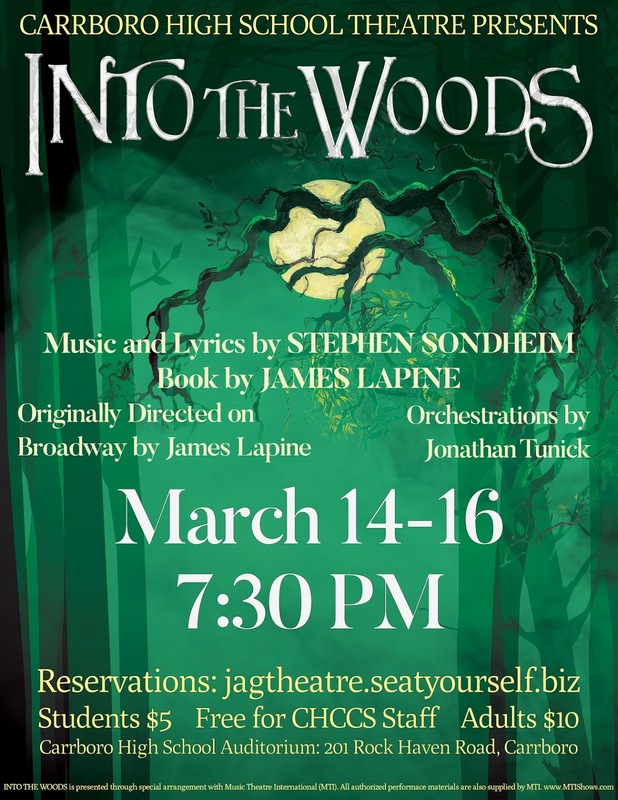 This Thursday, March 14, through Saturday, March 16, Carrboro High School will be putting on their spring musical, Into the Woods, originally directed by James Lapine on Broadway. The musical will take place in the Carrboro High School auditorium at 7:30 PM. Tickets are $5 for Carrboro students, $10 for adults and free for Carrboro staff. The musical follows multiple main characters who are making wishes for things they want, like a baker and his wife wishing for a child, or Cinderella wishing to go to the King’s Festival. When a witch tells the baker and his wife a curse was placed on their family, the two go off on a journey in hopes of reversing the curse. Along the way, the couple meets many other characters, such as Little Red Riding Hood and Rapunzel. The students participating in the musical, whether it be acting or working with tech, have been working on the production since auditions in January. Don’t miss the spring musical! Tickets can be bought at the door or reserved online at jagtheatre.seatyourself.biz. Carrboro High School’s band had their first concert of the year on December 14, 2018, showing their ability to perform familiar and unfamiliar music in a classical style. While not the most popular class in Carrboro, the students who take band really seem to enjoy and appreciate the experiences they get from the class. “I have gotten so many benefits from being in band that to be honest, it is kind of unreal. It’s been an eye-opener for me ever since middle school. And to be honest if I didn’t have band I wouldn’t be the person that I am as of today, and for that, I can not be grateful enough,” said Jeremiah Shelton, sophomore. “It’s really amazing to see kids perform in such of professional level,” said Vivian Pitts, Shelton’s mother. Most of the parents enjoyed the performance. It was a challenge for the class of 2018-2019 because there was a lot of growing that happened since 2017. A lot of new students and freshmen form the majority of the class. “Almost two-thirds of the band are freshmen, which [means] they will have a lot of growing as musicians,” said Casey Spillman, CHS’s band teacher. 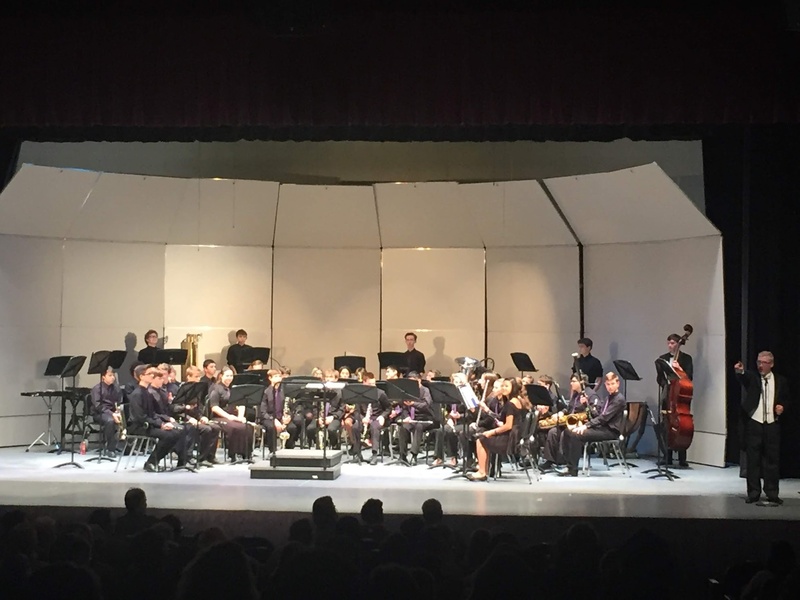 The band performance allowed students to show off their talents.“My favorite thing they did well is how much energy they brought to the stage,” said Spillman. Some of parents and students were surprised by the music selections, as a there was only one Christmas song. “They should have done songs that were more familiar. I thought they will have more Christmas music,” said Pitts. It’s very important that bands change their tone for each new piece, depending on the character. Instrumentation alone won’t do that. There has to be a concept along with it. Spillman had a lot of fun ways to involve others in the concert — not just playing instruments, but getting some teachers to wear helmets and tapping their heads with paper pipes to make music. Spillman also mentioned in the concert that the young musicians are working to become better and have more power in the music to impress families. The Latin Underworld is upon us again, bringing a day of mythology to the CHS auditorium. Latin students prepare monologues for significant figures in the Underworld and deliver them as classes walk through the auditorium, as if they had become part of the Underworld. Jane McGee, CHS Latin teacher explained what the Underworld is for those who don’t know. “The Underworld is a reenactment, a visual presentation of the Ancient Roman and Greek concept of what happened after life,” she said. It’s an opportunity for students to learn more about mythology, a topic that is heavily alluded to in popular culture and literature, such as many of Shakespeare’s works or more current works, such as the Percy Jackson and Harry Potter series. It also makes appearances in other social studies classes, such as world history. “When you’re studying world history, you read about the Ancient Romans and the Greeks, and understanding that ancient people had this idea that life didn’t end just because you died. It coexists with modern philosophies and ideologies as well,” said McGee, talking about the importance of mythology in modern education. Audrey Carson and Zoe Morris are two of the seniors that are helping to plan this year’s Underworld, and they went into more specific details about the event. “We’re going off, I think, the Aeneid now, where basically Aeneas entered the Underworld–someone gave him a golden bough and that allowed him to enter and leave as a mortal, and so we’re kind of playing on that with the classes now,” said Carson. The Underworld takes place on Wednesday November 7, between 1st and 4th periods. Last year, teachers had to bring coins to get into the Underworld, but this year, they’re bringing golden boughs, or golden branches, as seen in the Aeneid, a myth about the Trojan hero who traveled to Italy and was the ancestor of the Romans. Even though students read the Aeneid and other works involving figures in the Underworld, mythology isn’t a part of the curriculum for high school Latin classes, so this is an opportunity for the Latin students to learn more about these characters they’ve mentioned in class, and dive deeper into their myths. Some major figures and myths that will be represented are Hades and Persephone–or, as the Romans would say, Pluto and Proserpina–Cerberus, the three headed dog, Dido, Aeneas, Tantalus and many more. While the real Underworld is divided into three main sections, the CHS Underworld isn’t as accurate, but makes more sense. Along with expanding students’ knowledge of mythological characters, the Underworld gives Latin students a platform for their language. “It just seemed important to give the Latin students, who have very little opportunity to broadcast their language–it’s not the spoken language of Spanish or French, to give them presence within the school,” explained McGee. Morris agrees, adding on that it gives the Latin class a bit of character, and allows the rest of the school to see what the Latin students are about. Mother’s Day and Father’s Day are just over a month apart and right around the corner. When it comes to picking gifts, essentially all the same rules apply. Choosing gifts comes naturally sometimes, but other times life leaves us a little clueless. It’s okay though, because keeping just a few things in mind streamlines the process of choosing the ideal gift. The number one thing to keep in mind is the generality of a gift. Gifts for parent should be thoughtful and come directly from the heart. Think back to something your parent really wanted, but never took the time to get for themselves and you’ve got yourself a good gift. Gifts should also under no circumstances throw shade. Just don’t do it. Imagine the gift is an introductory book to Spanish. There’s a big difference between giving that to someone who wants to learn Spanish compared to someone struggling in a Spanish class. No matter what the intent of the gift is, if it can be interpreted as judgmental or insensitive, you should probably avoid it entirely. Remember: there’s a fine line be- tween a thoughtful gift and a hurtful one. Gifts people end up using a lot will constantly remind them of the gifter, but gifts that never get used aren’t harmful.Understand there is incentive to choose a good gift, but no penalty for being a little creative. Price also plays a very significant role in what gift to buy. Buy something that’s too expensive, or more accurately, something that seems expensive, and you’ll make your parents feel self conscious. A good way to minimize price while dramatically increasing value is to make gifts yourself. Homemade blankets, or fabric things in general, make good gifts. Homemade coupon books, on the other hand, may have worked when you were seven, but unless your parents specifically asked, it would be better to find something else. Then again, gifts don’t have to be limited to physical possessions. The classic breakfast in bed effectively conveys how much a person means to you by the effort put into making the meal. However, actually serving breakfast in bed is generally a bad idea as it is uncomfortable for the person eating and can be a hassle to clean up, especially if any accidents occur. Be careful when attempting to select something you are not familiarized with. You don’t want to be the guy that accidentally gets his dad the fifth book in the wrong series. Gifts can be a secret, but they don’t have to be. If surprising your parents works for you and adds something of value to the experience, go for it, but generally speaking it’s not a big deal. Mother’s/Father’s day gifts aren’t necessary like birthday gifts. They hit a sweet spot between practicality and need. In the end, you aren’t just celebrating a person; you’re celebrating your parent’s efforts and successes. If your parent is into carpentry, maybe consider a tool or gadget they don’t already have. If they like to cook, a cookbook isn’t a horrible idea, but a utensil specific to what they cook, like a spatula, might make a better gift. If they like piña coladas or dancing in the rain, buying a blender might be too expensive, but some stylish rain boots might do the trick. 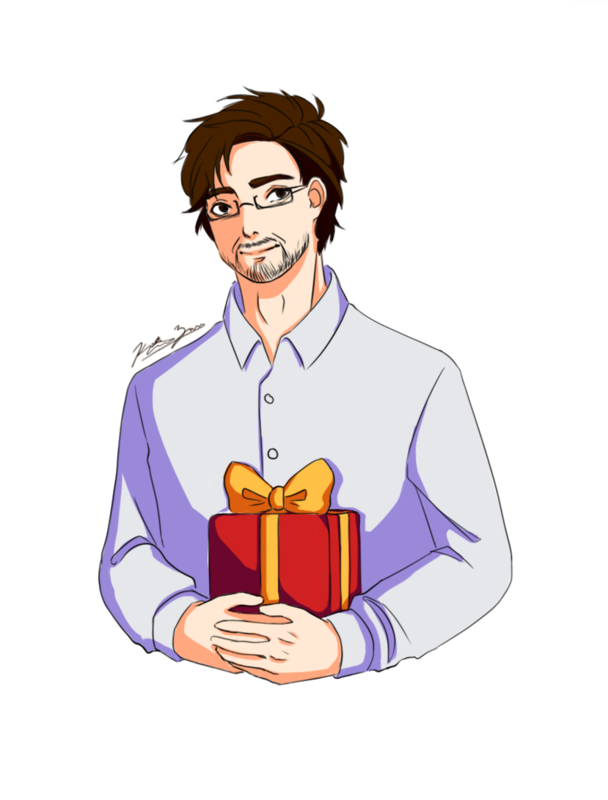 The amount examples for specific situation make all the possible gift combinations virtually unlimited, so remember not to stress yourself too much. You might as well check yourself before you actually wreck yourself, but it’s not the end of the world if you mess up. Feel confident that the gift you thoughtfully selected is the best one you could have given. Tattoos: a form of self expression rarely seen amidst a high school population because, legally speaking, you have to be eighteen to get a tattoo in the state of North Carolina. Therefore, the select few who have chosen to have something permanently inked on their body naturally draw a considerable amount of attention. Evie Joseph, a senior at Carrboro, is among the select few sporting tattoos at Carrboro. Her tattoo is the female symbol, and inside of the circle is an outline of the continents of the world. It lies on the right side of her ribs. “[My tattoo] has a few different meanings; the globe part, by itself, shows my passion for travel and global justice,” said Joseph. Joseph got her tattoo on February 25 of this year, but says she’s always known she wanted a tattoo. Joseph says it’s important to solidify your tattoo ideas long before you commit to them, because – although they are fun – they are permanent and to a certain degree cannot be removed. Laws pertaining to tattoo guidelines differ from state to state. Therefore, it’s important to keep in mind that, in the state of North Carolina, you cannot legally get a tattoo until you are at least eighteen years of age. Even with parental consent, tattoo parlors can not legally give you a tat- too if you are underage. If you are someone thinking about getting a tattoo, make sure it’s something you are certain you want, since tattoo removal can be especially pricey. Once you’ve solidified your design, make sure you find a place that fits your needs and abides by state-regulate codes. Hygiene is key when making decisions that will permanently alter your body. After taking proper precautions, students can have positive experiences. Nearly a century old, Sutton’s Drug Store is truly a Chapel Hill institution. Reflecting the establishment’s ties to the community are the thousands of photos displayed on the historic walls. In fact, since the 1980s, Sutton’s employees have taken over 10,000 photos of the store’s many patrons. In addition to its well-known burgers, sodas and specialty items, Sutton’s housed a pharmacy for 91 of its 95 years; only in mid-2014 did John Woodard, owner, sell the pharmacy to nearby CVS. Even without the pharmacy, the owner stays busy. Sutton’s food truck, which stations itself on Rosemary Street, opened just two months after discontinuing the pharmacy. Fun fact: Years ago, there was a toy store in the basement of Sutton’s. Waffle Shoppe has always been a family-run business. Husband-and-wife duo James (Jimmy) and Linda Chris — both NC natives — founded and operated the restaurant until Jimmy passed in 2012. Linda now works alongside her daughter, Melissa, to maintain the family tradition. To cultivate the restaurant’s simple and charming ambience, the Chris family stripped down the building’s interiors and renovated the space before opening to customers. The menu touts similarly simple, yet timeless, breakfast items. Fun fact: While renovating the building in the 70s, Jimmy incorporated materials from a former Greek Orthodox church — the same church where he and Melissa married. Mildred “Mama Dip” Council was born in Chatham County and cooked for numerous local businesses before she opened this revered Southern-style restaurant. Council has alway valued locally-sourced ingredients, long before eating local became trendy. Her fresh Southern food quickly attracted locals, and Mama Dip’s established itself as a staple of the community. In the more than four decades since its inception, Mama Dip’s gained national recognition; Council authored two cookbooks, and Rachel Ray featured the restaurant on her program, $40 a Day, in 2004. Today, Council’s family members manage most of the daily operations, but she maintains an active role in the restaurant. Her granddaughter, Tonya, even started her own businesses, Tonya’s Cookies, across the street. Fun fact: Mama Dip’s started its first day in business with only $40 to spend on food. It ended that day with over $130 in profits. Ready Player One Done, Unready? 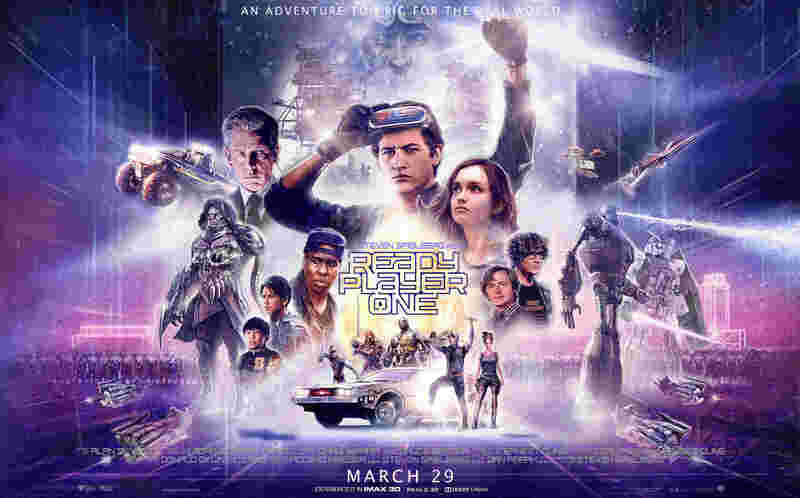 After seeing the first trailer for Ready Player One, I was incredibly excited, as any normal person would be after reading Ernest Cline’s novel of the same title. When someone makes a movie based on a popular book, readers tend to forget about the countless books that have ultimately been butchered by their movie-makers. I became one of those blind fans. But the film is by Steven Spielberg, so it should be okay, right? Since I’m such a sucker for video games, cartoons, anime and the like, I was bound to fall in love with the movie. There were so many references and characters appearing from games like Halo, Over-watch and more from shows like Danganronpa, Gundam and The Breakfast Club to name a few. The story is based off of a dystopian world in the year 2045 where people use the OASIS, a virtual reality world, to escape the the dread of the real world. The creator of the game, James Halliday, passes away and leaves his entire fortune as an ‘easter egg’ in a large quest meant to find someone worthy of obtaining it all. (IOI), an enormous company, from obtaining the power of the OASIS. All this is followed by sarcastic jokes and 80s video game and show references. Sure these are typically “mainstream” games and shows, but many of those used in the movie are classics which allow the flick to grab the attention of different age groups. But as great as the animation and obvious game advertisements are, there are still some big disappointments to this movie compared to the original novel. There are some major — I mean really major — plot holes in the movie. One is the ‘Extra Life’ coin that Parzival, or Wade Watts, gets when the main antagonist detonates a bomb that eliminates all avatars on a planet. Nowhere in the movie is there a clear explanation as to why or how he gets the coin. He just discovers it in his pocket when he realizes he is still alive. In contrast to the vagueness of the movie, the book has a clear explanation to Parzival’s possession of the coin. In the novel, Parzival comes across an arcade right after he gains the second gate key. The game he plays in the book is PacMan, and he gets the coin by beating the game altogether. Aside from the coin, there are significant details relating to the characters from the novel that were pushed aside in the making of the movie. It should also be mentioned that Daito and Shoto, the supposed brothers in the movie, never actually met in real life. They were both enrolled in a support group for hikikomori in Japan, which was for OASIS addicts who’d disengaged from the real world. Character appearances were also compromised in the movie, which is a common issue among films made by big film companies since they tend to hire actors and actresses who have ‘pleasing’ appearances and figures. struggled with his weight either. Samantha (Art3mis) and Helen (Aech) were over- weight too. As nice as it was to see a real boy-ish character like Helen in the movie, the avoidance of social issues like how awkwardly obese children are treated by others and how isolated teens exist today was disappointing. With all these faults out of the way — though there are several more — the movie was a success and is still an amazing movie that took extensive time to film and animate. That is, at least, without the book in mind. There is still so much left out of the movie, so many social issues, significant moments and details about characters. I get it though, since movies have a general time limit that they have to follow before their audience gets tired, and this movie was already a good two hours and 19 minutes. In the end Steven Spielberg made a great movie, but like all other live-action films for books, he still took away so many things that made the novels great. He focused on a creator’s crush on another man’s wife and took away most of the focus on the other members of the High- 5, putting it all on the protagonist and his love interest. At Tacos Ramirez, I feel taken care of as a vegetarian customer; they offer guacamole (at no extra charge), cheese and rice as part of their veggie tacos. My only com- plaint would be a lack of variety as there are only so many ways to mix up a taco. But always fresh, and always delicious, the tacos shine all on their own — although they are best complemented with a squeeze of lime and a drizzle of their signature hot sauce. While the Monterrey restaurant is an experience on its own, the Monterrey food truck takes it to an- other level. Somehow, they are able to keep the same great food quality, the same fast timing and the same impeccable service that they uphold at their storefront. What I really appreciate about the Monterrey food truck is its variety for non-meat-eating customers like myself; I have many options to choose from, ranging from tacos to burritos to rice dishes, and they even have a vegetarian chimichanga if you ask! I know…they really did it to us. My only criticism is that you have to get creative if you’re ball- ing on a budget; remember the beauty in ordering side dishes! Their portions do not disappoint. 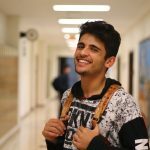 One quick look at my instagram feed will tell you that I am a sucker for beautiful scenery. 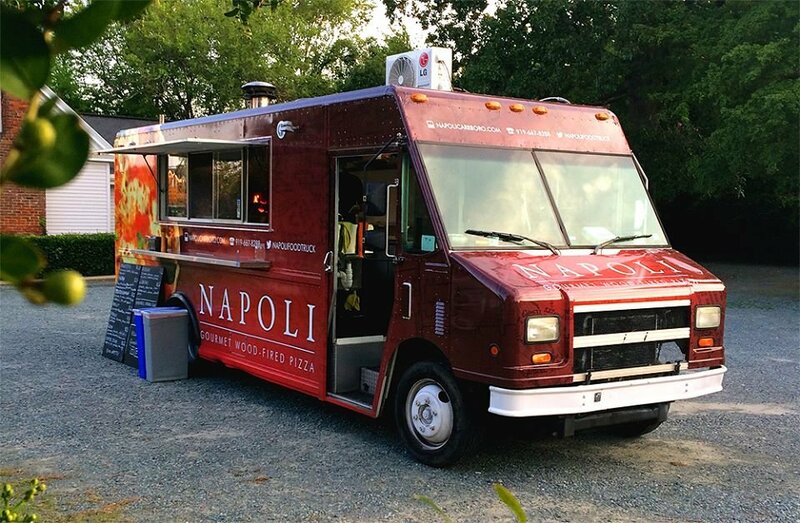 Settled in a pleasant grassy area next to the lumber store parking lot — which, let me tell you, can easily be cropped out in a photo — the Napoli truck is the perfect place to enjoy an aesthetically pleasing slice of pizza. Unfortunately, for me, the beauty stops there. I almost feel as if, sitting under the fairy lights at a perfectly imperfect wooden picnic table across from your lover/best friend/mom/dog, you can forget that your pizza is literally charred and crumbling before your eyes. Maybe wood-fired pizzas aren’t my thing, but I honestly can’t even discuss the nature of the food, because I am immediately overwhelmed with one flavor: charcoal. Despite this, Napoli gets brownie points for its fresh mozzarella and, okay, surprisingly diverse vegetarian section of its menu. Given America’s obsession with burgers, hot dogs, fried chicken and steak, I quickly realized that foods from other countries were my best friend. Heralding authentically made Chinese dumplings and noodle bowls that look straight out of a Miyazaki film, Chirba Chirba seemed like my dream come true. Their dumplings looked plump and flavorful, their noodle bowls dense and colorful—needless to say I was excited. That is, until, I trot on over to the truck and discover that they offer one singular vegetarian option: sweet potato dumplings. Putting my aversion to sweet potatoes aside, I order them anyway. Chirba Chirba conveniently does not advertise these dumplings in photo form on their truck, and after receiving them, I see why. Flat and seemingly lifeless, the dumplings were already not giving a good first impression. Unfortunately, I only grew more disappointed from there. The filling seemed to be entirely comprised of spicy sweet potato mush and, to be quite honest with you, I felt like a literal baby. Here I was, expecting a lovely vegetarian dumpling, only to find myself wiping blended potato from the corners of my mouth and hoping no one sees me consuming this boujee infant cuisine. I have heard good things of their meat dishes, but, needless to say, this vegetarian will not be coming back.